MRI Depot is committed to provide your facility with the highest quality interim diagnostic imaging products to meet almost any budget. 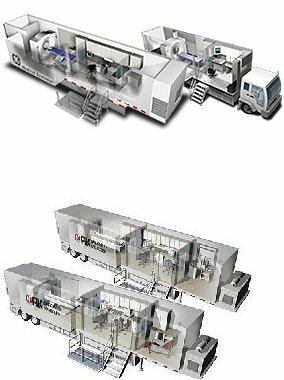 We specialize in providing interim solutions in mobile MRI, CT, and PET imaging equipment delivered to your site to meet virtually all your short or long term imaging needs. Whether your current machine is down, or you maintain the benefit of planning ahead for your future imaging needs. MRI Depot can offer a wide array of imaging solutions to help you through these times. We guarantee dependable, on time delivery of the equipment we lease; Flexible & competitive pricing plans; Pre-planning, delivery and set-up. Need applications training? We will be more than happy to provide industry professionals to assist and train your staff. MRI Depot works on behalf of our clients to provide them with the most competitively priced interim solutions in the business. MRI Depot Alliances: We literally have thousands of contacts in the medical imaging industry, giving us access to the nations supply of interim vehicles available at your disposal. Available Equipment: Most manufacturer models are available to meet your specific equipment needs within your budget. Each system has been certified by its manufacturer to meet all operational and diagnostic performance specifications. Hassle Free: Complete turnkey solutions from interim site planning through system check out and follow up system maintenance. Flexible Terms: Our rentals are available for terms to meet your needs.